While the drama of legal battle between Mamata Government and the BJP regarding the latter’s Rath Yatra in West Bengal continues in Calcutta High Court, civil society and organisations are worried about the spectre of competitive communal politics in the state, aggressively pursued by both the ruling TMC and the opposition BJP. The proposed Rath Yatra covering almost the entire state is undoubtedly the BJP’s gameplan to push it’s agenda of deepening communal polarisation in the state ahead of the general elections. In the recent past, West Bengal witnessed a number of communal riots and clashes, armed rallies of various Hindutva organisations raising anti-Muslim slogans during Ram Navami, aggressive celebrations of Hanuman Jayanti across the state. This in addition to various statements by central BJP leaders including Amit Shah threatening an NRC process and deporting Bengali Muslims from West Bengal to Bangladesh, has communally charged up the politics of the state. With the collapse of CPI(M) and it’s increasing irrelevance in the electoral politics of West Bengal, the BJP with its aggressive brand of Hindutva has already emerged as the main opposition party to TMC in the state. The TMC with its electoral strategy of consolidating the near 27 percent Muslim vote in its favour, is accused of being soft on Islamic fundamentalist forces and is perceived by a large section of the Hindu population as not only corrupt and authoritarian but also as openly “appeasing” Muslims. Though this perception has some material basis, but it has been blown out of proportion by the BJP and various Hindutva forces. To counter this growing perception among the Hindu populace, Mamata Banerjee has significantly reduced public visibility of her association with Muslim signs and symbols, and has entered into a competition with the BJP in proving that her party is ‘more pro-Hindu’ than the BJP. The grand celebration of Hanuman by the TMC, the promise of building Sun Temples across the state, the alleged infiltration of Bajrang Dal and it’s near takeover and control in some areas by local TMC leaders are only a few examples. It is in this context that the proposed Rath Yatra by the BJP throughout the state, passing through various sensitive places where riots had taken place in recent past, is worrying and alarming. “AAMRA – Ek Sacheton Prayas” (“We – A Conscious Initiative”), a civil organisation from the state is doing serious work in documenting the communal riots and disturbances by visiting the affected areas for the past many years. A team from the above collective recently visited all the places from where BJP’s Rath Yatra is to be flagged off. 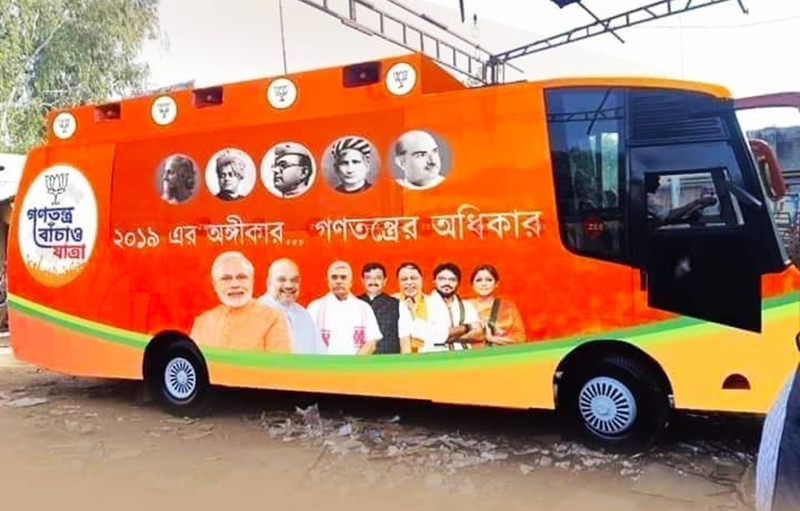 We publish here the English translation of the fact finding report prepared by the above organisation which visited Gangasagar, a few days before Amit Shah was scheduled to flag off one of the Rath’s – basically a hi-tech luxurious air conditioned bus. The original Bengali report can be found here on AAMRA’s official Facebook page. সব তীরথ বারবার, গঙ্গাসাগর একবার! It is here that the proponent of Sankhya philosophy, Kapil muni (sage) arrived from Ayodhya to lose himself in the philosophical pursuit. According to the myth of the Puranas, the descendant of King Sagar, Bhagirath, got the Ganga from the Himalayas to the ocean. Gangasagar, a delta in the Sunderban areas, is the place where river Ganga meets the Bay of Bengal. Every year lakhs of virtuous devotees visit Gangasagar aka Sagardwip, in order to worship Kapil muni and Bhagirath. Approximately 2 lakh people live on this island. 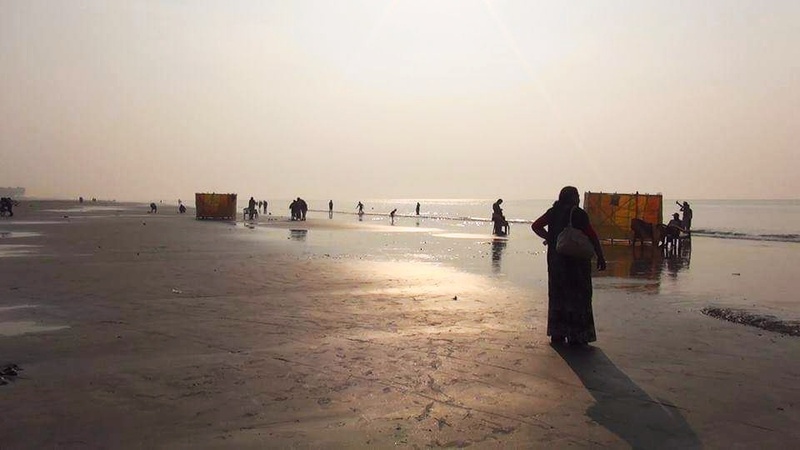 Located near the international border of Bangladesh, Muslims are a slight numerical majority in the island. But throughout the year the place is visited by lakhs of devout Hindus. The Sagar block is comprised of 9 village panchayats. Every year depending on the position of the sun, devotees swarm to Gangasagar to celebrate Makar Sankranti (winter solstice) and take dip in the sea. Like every year, the arrangements for Makar Sankranti have begun in Gangasagar this year too. But another event is supposed to take place 5 days prior to the day of the solstice. The Bharatiya Janata Party President Amit Shah is supposed to visit the island for his party’s “Rath Yatra”. The announced purpose of the yatra is to publicize the success of the present Central Government of Narendra Modi and to condemn the misrule of the State Government under Mamata Banerjee, and propagate the establishment of democracy in the state of West Bengal. But what could be the reasons for choosing this sparsely populated religious place for a political program? 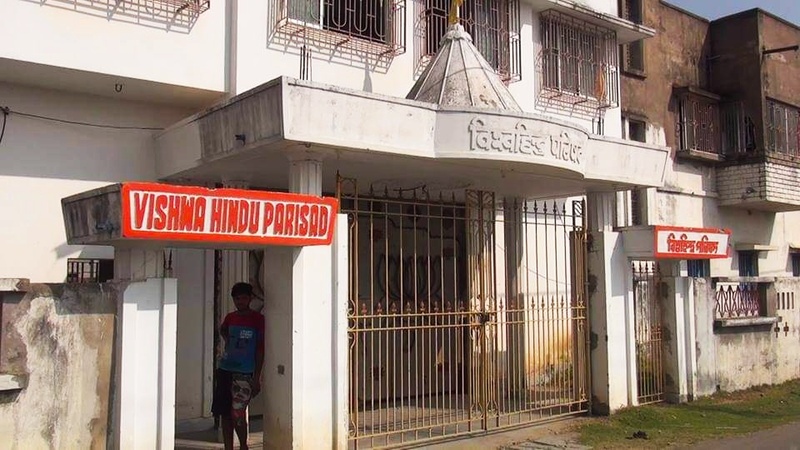 Twenty years ago, the Vishwa Hindu Parishad had established its first office here. 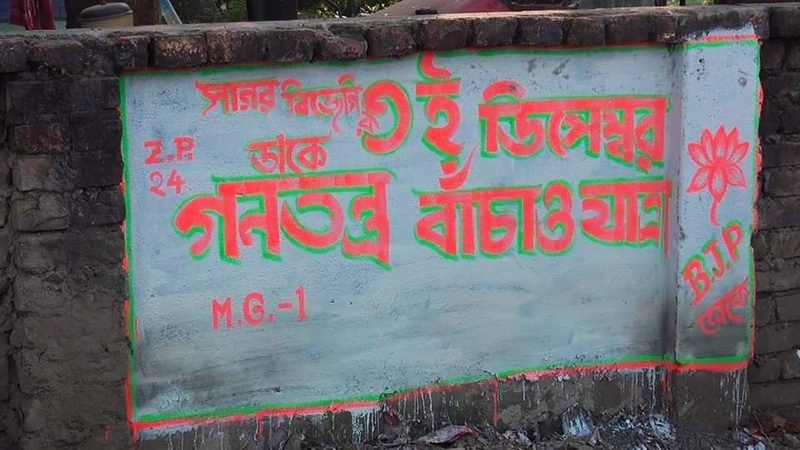 Few years back, the Rashtriya Swayamsevak Sangh (RSS), one of the principal organizations of the Sangh parivaar, also set up their office in Gangasagar. Recently the Sangh has started physical training programs of the local youths to initiate them into the political ideology of Hindutva. Gangasagar is therefore not a sudden or random choice for the Rath Yatra. Various political activities have been taking place here for some time now. It is not difficult to understand that the Sangh Parivaar wants to increase the influence of Hindutva and establish their political authority in Muslim-dominated Gangasagar. But is there something more to the agenda? After all, Gangasagar is the land of Kapil, a proponent of Sankhya philosophy, a non-believer in God and an opponent of the Vedas. 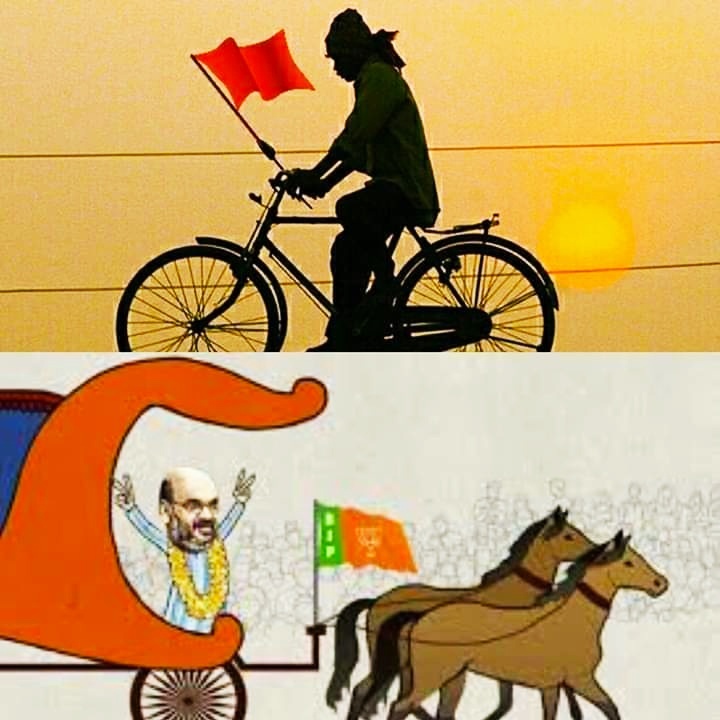 Does the choice of Gangasagar for Amit Shah’s Rath Yatra point at some long cherished plan of the Sangh Parivar? Kapil Rishi’s birth has already been linked to the Hindu god Vishnu. Will another godless Budhha be made into a reincarnation of Vishnu by the Sanatan Hindus? The atheistic rationalism of Sankhya is still one of the principal philosophical opposition to the Sanatanis. If the memory of that opposing philosophy can be twisted in its place of origin, then how difficult could it be then to appropriate the philosophy itself! While conducting fact finding enquiries into recent communal riots in West Bengal, we realized it is necessary to intervene before the riots actually take place. It is necessary to unmask in advance the plans and preparations for such flare-ups. That way at least people could be informed and apprised of the facts behind the scenes. We hope that way the Government, which is aware of everything but does nothing, is also reminded of their duties. Our capability is limited. We are trying to do as much as we are capable of, but we wish we could do much more. Before Amit Shah’s Rath Yatra, as representatives of “AAMRA- Ek Sachetan Prayas” [“We – A Conscious Initiative”], we visited Gangasagar. We spoke to different people, political workers and leaders. Our attempt was to understand the demography based on religion, the relationship between different communities, their major professions, socio-political conditions, the attitude of people towards BJP’s Rath Yatra and the response of the political parties to this program. President, Trinamool Congress Minority Cell, Sagar Island. 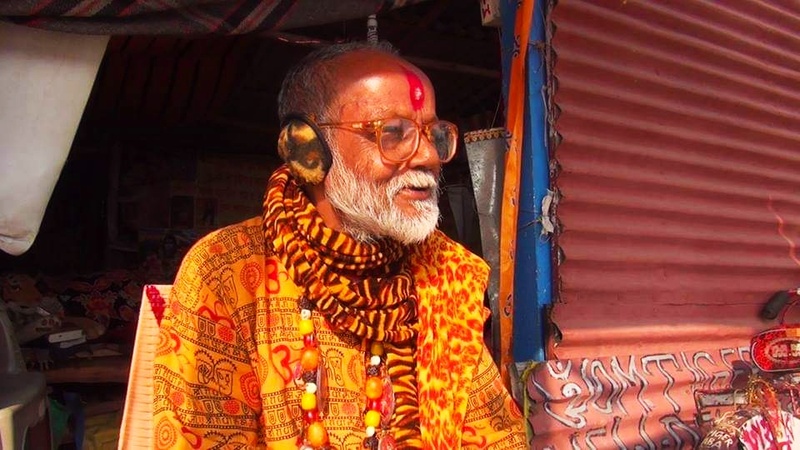 “Both the communities have historically lived peacefully in this Sagar Island. Though the Viswa Hindu Parishad set up their office here some twenty years back, but still it didn’t cause much of a problem. The troubles started in 2008. One day they brought a lot of people from outside. Many of them were staying in the Dharmashala of Kolkata Textile Traders Association. They took bath in the sea, and then while rallying back to the Dharmashala they raised anti-Muslim slogans. 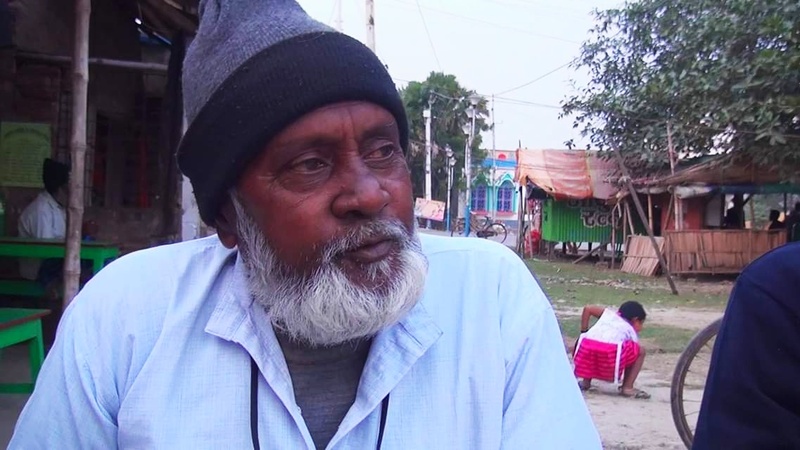 ‘Gangasagar mein rahna hai, toh topi-Quran chodna hai [In order to stay in Gangasagar, dump your topi and Quran]’. Listening to these slogans many Hindus among the local Van drivers walked up to them and raised objections. In response, the outsiders/visitors attacked these people. Following this incident, people from the Sagar gheraoed the Dharmashala-office and protested. Then the police came and arrested them. As much as I can remember the police arrested twenty of them. We were also arrested on a counter-case based on false charges. That case is still not closed. “What do you mean by ‘there’”? He told us his name. But also requested us not to disclose it. After this, our fact finding team proceeded towards the newly built Kapil Muni shrine. His original ashram was lost in the ocean since long. In 1973, a temple was built off the coast. 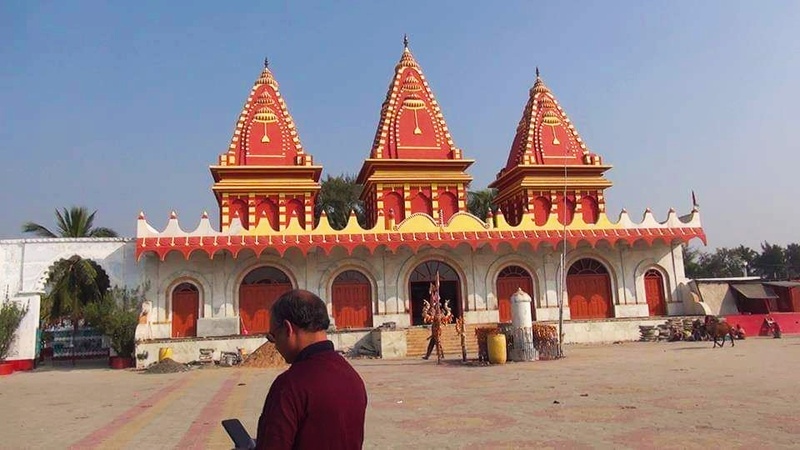 In 2013, the temple was reconstructed under the supervision of Satnami Akhara (based in UP). When we reached, evening prayers had begun in the temple. We ran into a sanyasi called Tiger Baba, who moves around on a bicycle. Everything from his shoes to his bicycle bore the name “Tiger Baba”. “Where do you stay?” we asked him. “Here in a hut. Earlier I used to live in Delhi”. How did you reach here? We didn’t want to disturb the other sanyasi’s immersed in prayers, and proceeded towards the sea. We had tea, and got into a “Toto” (battery operated Rickshaw van). Our destination was Sheikh Ismail’s residence. He was once an influential CPI(M) leader. 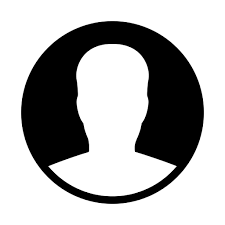 He is a well-known name in this area. Our Toto-driver said he knew Ismail’s house, which turned out to be quite far from the sea beach. Our Toto driver called out his name as we reached the collapsible gate of his house. Ismail, roughly 70 years old, himself came out. He brought us chairs to sit. We introduced ourselves and told him about the purpose of our visit. Ex-President of the Sagar Panchayat Samiti, CPI(M) District committee member. We couldn’t reach a conclusion on what were the main reasons behind such incapabilities of the Left Government – whether it was electoral concerns or was it the social risk behind talking about atheism in this country. Our conversation ended with Ismail alleging the TMC’s role in making corruption a social norm, from road construction projects to building of schools, based on his own personal experience. From talking to various people, shopkeepers, van pullers, toto-drivers, we realized that the main occupation of people here is agriculture, spanning paddy, vegetables and paan (beetle leaf) cultivation. Other that this, people also depend on fishing in the river and the ocean, small business, transportation service etc. At times, cyclonic depressions bring clouds of anxiety in the daily life of people here. On the following morning we went to the sea beach. The beach was crowded with pilgrims mainly coming from northern India. The wide road between the temple and the beach was lined by countless small shops selling artifacts made from sea shells, conches and jute. One of these shops happens to be the shelter for Tiger Baba whom we met the previous evening. He was standing in front of his shack. It was filled with images of numerous gods and goddesses, and Sanskrit mantras written in Bengali script. “Yes”, he said. “But my connection with Bengal was only during my childhood days”. After a while we found that his conversation was becoming incoherent and hard to follow. Added to this was a constant outpouring of steep anger and hatred coming from the childhood experience of having lost everything in riot. Even sanyas hasn’t helped him to get over this anger-hatred-despise. We left with a feeling of sadness for the old man. Our next destination was the VHP office, near the bus-stand. A sizeable, 2-storeyed building. We ran into a young man at the main gate of the office. He spoke fluent Bengali, though a slight Hindi influence revealed his non-Bengali roots. “Do you have an identity card?” he asked. “About the Rath Yatra, you should talk to Abani babu. He is a local, and he can tell you about it.” He called out to the earlier man who took us inside. Mr. Abani came and sat facing us. His full name was Abani Pradhan. He is an RSS-trained Swayamsevak, and has worked in various districts over the years. Currently he is in charge of Sagar island. But he described himself as a “VHP worker”. From here we started for the Textile Traders Association guesthouse. Its maintained like a usual hotel. One of the workers in charge there told us that the Guesthouse is only for families. But we were also told that frequent residential camps are also organised here. In 2008, participants of one such training camp, while returning in a rally after taking dip in the sea, started shouting anti-Muslim slogans. Some people on the streets objected, at which point these trainees charged at them. That sparked the violence that time. Here we also met a young person, who is connected with the BJP. From him we got the contacts for the General Secretary of the party’s Sagar Block committee, Buddhadeb Bhuiyan. We spoke to him over phone. We bode farewell to this conscious young man, and proceeded towards Kochuberia to return back. Once upon a time, because of its inaccessibility, a popular adage that was used was “Sab tirath baar baar, Gangasagar ek baar” [All other pilgrimages can recur, but Gangasagar is once in a lifetime]. Today traveling to Gangasagar is comparatively much easier. Today, the government’s tourism booklet on Gangasagar proclaims “Sab tirath ekbar, Gangasagar baar baar”. Now it doesn’t take too time to reach Gangasagar from Kolkata (provided the vessel from Harwood point to Kochuberia is on time!). We returned with the desire to revisit again. However, we couldn’t leave without an anxiety. Would the traders of politics be able to restrain their greed for power, and leave this island in peace? Would these politicians allow the two different communities to live together in peace like they have been doing for thousands of years till now? On 6th December morning, Sagardwip TMC leader Sheikh Rustam Ali called and said, “Our party program has undergone a slight revision. We have now decided to conduct a public meeting in protest against BJP’s Rath Yatra, on 8th December at Number 5 bus-stand in ‘Sagar’. 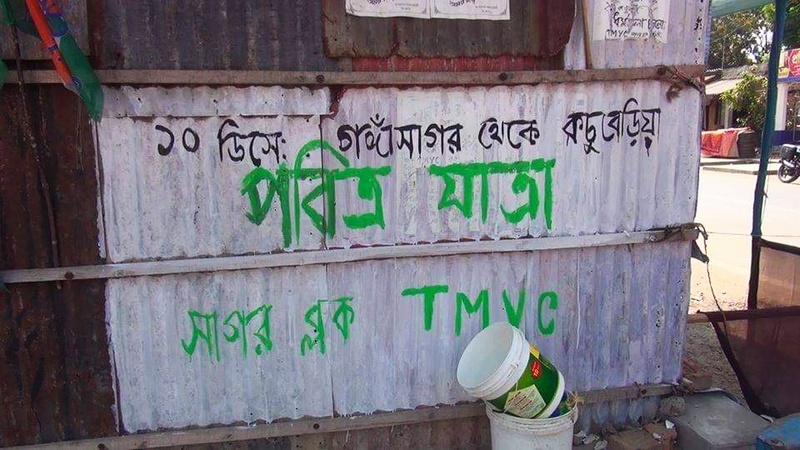 And on 10th, we will take out a peace rally from Gangasagar to Kochuberia”. The Kolkata High Court stayed Amit Shah’s Rath Yatra in Coochbehar, till the next hearing on 9th January, citing issues of law and order. On 20th December, High Court judge Topobroto Chakraborty passed an order allowing the “Ganatantra Bachao” Rath Yatra, condemning the State Government for being unreasonable and whimsical in trying to disallow it. The State Government filed an appeal to a higher division bench, against the 20 December order. On 21st December, the division bench yet again stayed the Rath Yatra. The “AAMRA – Ek Sachetan Prayas” [“We – A Conscious Initiative”] fact-finding team members who drafted this report, included Sushmita Roychowdhury, Subhash Das, Farook ul Islam, Mohit Ranadeep. AAMRA stands for “An Assemblage of Movement Research and Appraisal”. The report has been translated from Bengali to English by GroundXero. Photos are courtesy the fact-finding team.